Cut the bread slices into half. Take a bowl. Add curd, green chutney, dry coconut powder, salt and mix it well. Take another bowl and mix mustard seeds, cumin seeds and sesame seeds. Take one half slice of bread. Apply curd mix onto it and put another half on it. These way apply curd mix on all the slices. Keep it aside. Take tawa. Add 1 teaspoon of oil and one or two pinch of mustard seeds, cumin seeds and sesame seeds mix. 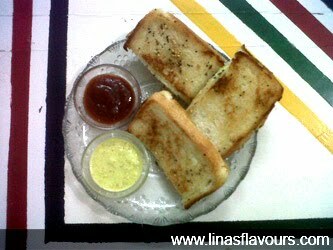 Put 2 bread slices on it and cook it on both the sides till it is light brown. Same way cook it all the slices.